Its been nearly a month since I last turned the telescope on. Looking at the satellite picture at dusk, I didn't think the clear skies would last. However, the clouds kept away for a couple of hours longer than I expected. 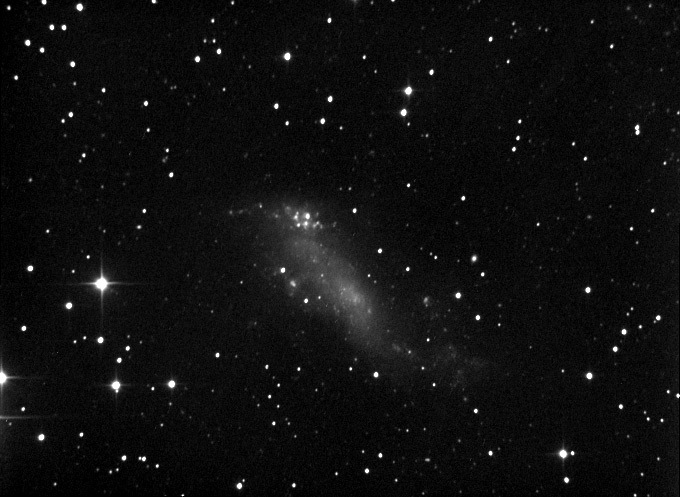 It has been such a long time since I imaged, I'd lost track of what I wanted to do next. Jumping around the sky, I found that the transparency and seeing were both a little better than I thought, so I visited the rarely imaged IC 2574 galaxy called Coddington's Nebula. Coddington's nebula, IC 2574, is close to the popular M81 and M82 galaxies. Its part of the M81 galaxy group, which is one of the nearest groups to our own Local Group, being a mere 12 million light years away. I've frequently seen it on the charts of the region, and had it at the back of my mind to image, so that I had a more complete collection of the M81 group. It's very knotty and irregular, and hardly looks like a recognisable galaxy. Edwin Foster Coddington (1870-1950) was an American astronomer who discovered this galaxy and also has a comet and three asteroids to his name. This was my first visit out with the scope since I'd made the new dovetail bar for my LXD55. It was also the second outing with the homemade filter wheel, so I was interested to see how these things would perform. The dovetail worked well - i.e. I didn't notice it, and guiding was fine with regard flexure. The clouds prohibited any colour. I did notice during imaging that there was some diagonal stretching of the stars. I thought it might be flexure, but a little bell rang in my head, and I popped outside to the scope - to find it buzzing! Something inside the Artemis camera was catching on the fan - causing a buzz and a vibration. Taking advantage of nature's bounty, I found a small twig on the ground and wedged it in the fan to stop it going around... and the starshapes soon cleared up. I guess I will have to take it appart and solve that one properly! 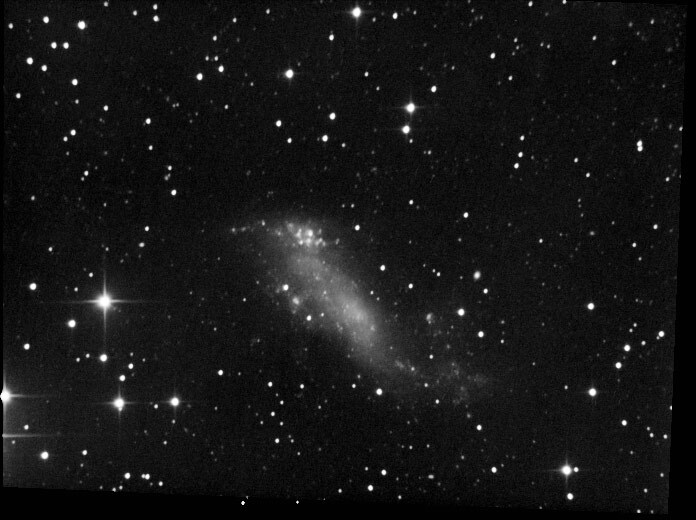 Overall I am happy at how this faint and highly irregular galaxy has turned out with relatively short exposures. I am keep to add some colour to this at some point. Not a particularly striking image, but pleasing nevertheless. Captured with 2x2 binning in ArtemisCapture. Calibrated and stacked in Maxim. Combination of DDP in maxim and curves in photoshop used to produce final image. Guided with a fixed 400mm refractor and an SC1 black and white modded toucam using Guidedog. This evening I have added another 10 frames of 650 seconds exposure 2x2 binning to the luminosity layer, and also added RGB. Each channel of the RGB is 3x300s at 3x3 binning. I am not happy with how the colour has turned out, the background is way too blotchy, and the stars lacking in colour. One major problem was the large number of hot pixels you get when binning 3x3 on the colour. I think I might have another reprocess of this at some point.